Want to get 10,000 followers on Twitter!?! BUY MY E-BOOK! Want to get 10,000 followers on Twitter!?! No, I’m not going to charge $0.99 (or 2 for $1.97), as promised, and the first 1,000 people to retweet it will not get a free copy. The number of followers you have on Twitter means absolutely nothing. Remember the old analogy: it doesn’t matter how big it is, it matters how you use it. If you engage with others in a spirit of community (you know, helping your neighbours…), you win and your followers win. Twitter is an amazing channel for communication, but there are a few things that make it awkward, or even annoying and counter-intuitive. Add spammers to the mix, and the whole experience gets a bit hairy. 1. I stopped caring about the “Home” feed. The home feed is an age old dilemma for serious Twitter users – once you start following more than a couple hundred people, your home feed becomes effectively useless. The old answer was to start a “secret” account where you secretly follow the people you really want to? Today, this is much simpler – build a list of the people you truly want to follow. I use many lists and searches to find who and what I’m looking for on Twitter. The home feed is dead to me. 2. I discovered the best ways to alert people to your existence is to follow them or list them. Most people start on Twitter by writing stuff. Intelligent, informative or witty tweets don’t mean anything if nobody is paying attention. Some people get bored and quit; others learn about tagging posts, searching, retweeting, following people, and replying. I am most interested in connecting with people in my geographic region – Victoria, Vancouver Island, Vancouver, Seattle. This is both natural, and a business decision (my main business, IdeaZone.ca, serves clients primarily in Victoria, and I organize events to serve the region, like the upcoming Social Media Camp). So I find people I want to connect with, I follow them, and I list them. What have I noticed? Many of them tend to follow-back, and often they send a message. This is totally fine, and I will eventually unfollow these people. Does that mean I don’t like them anymore? No. It doesn’t matter to me? Remember, I don’t read my home feed, I keep them on my lists, and they still show up in my searches. Some of the best interactions I have are with people who don’t follow me. I unfollow them simply because Twitter won’t let you follow more than 110% of your followers, so they are using up a notch in my ability to discover and connect with new people by alerting them with a follow. 3. As a policy, I follow people who follow me. I do this for two reasons: (1) I don’t have time to filter through and find the good or bad accounts, and (2) people cannot send you a DM if you don’t follow them. The latter is important (for me, not everybody). I’m in business, if I prevent somebody from sending me a DM, I might be preventing them from sending me business, or a referral. I don’t want to risk snubbing a potential client. I’m fairly certain this policy means I’m “following” some pretty sketchy accounts as a result, but remember, I don’t read my home feed, so all the sketchy people in the world could follow me, and it means nothing to me. And this, my friends, is how I got to 10,000 followers on Twitter, probably half of them are real people I want to connect with, and the other half are spammers. To the uninformed, it might look pretty to have 10,000 followers, but I can assure you it means nothing – but the several hundred or so folks I have had the privilege of connecting with on Twitter have made a huge difference in my business, and my life. 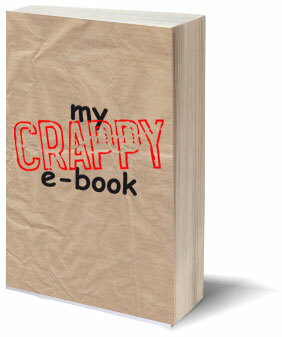 And thanks for reading My Crappy E-Book.